This past Wednesday, the varsity girls soccer teams from Warde and Ludlowe faced off in an exhilarating match at Ludlowe that resulted in a 1-1 tie. The turnout was incredible. Crowds were lively and players were anticipating the game that was to come. 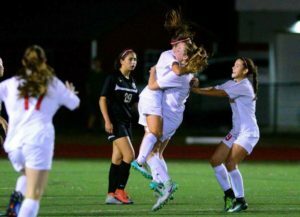 The Warde girls soccer team was led by three fabulous captains, seniors Teresa Andres, Lauren Tangney, and Katie Rigione. As the game commenced, the tension was almost visible. During the first few minutes of the game, Ludlowe was able to slip a ball through the midfield and defense, and their forward took a nice shot on from far out and scored. Warde quickly turned it around and had a possession for almost the entire game, giving Ludlowe minimal chances to score, and was winning all the 50/50 balls in the midfield, especially thanks to Avery Oracheff. Katie Rigione and Olivia Seymour were doing an incredible job in the defenseman marking and making sure that nobody got past them. The game was interestingly very physical and aggressive, and Ludlowe’s players were given several yellow cards. In the last 15 minutes, Warde started to bring the intensity and had several great chances on goal. During the last 10 minutes, Lauren Tangney got fouled in the penalty box and a penalty kick was called. Teresa Andres stepped up to take the kick. Another yellow card was handed out to a Ludlowe player for rudely trying to psych Andres out about the kick. Teresa made the goal, and the crowd went wild. In the last several minutes, Warde had several chances on goal but the game ended up with a 1-1 tie. Warde wraps up their season with two home games, one with Brien McMahon and the final game against Ridgefield.